Jason Bare had long ago given up looking for it. It was a song he had co-written with his cousin Amanda who was more like his sister, growing up in their close-knit family. But Amanda had walked a different path than Jason, battling addictions much of her life. Jason was encouraged, however, as Amanda finally seemed to be turning a corner and getting her life together. Yet in 2009, it all went terribly wrong when Amanda, at age 27, died suddenly of a medically-induced drug overdose. That same day, without looking for it, Jason found the song he had written with her and immediately, he knew why. 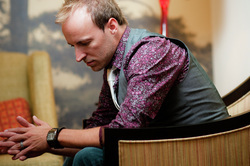 On his new CD, Beautiful Design, produced by Loren Barton (Felicia Barton, Coko) and Nathan Walters (former vocalist with Plus One), Jason melds his love of worship with what he describes as his “need to wail.” After spending a lifetime growing up in church as a preacher’s kid, attending Lee University and traveling as part of the Lee Singers, honing his songwriter skills and releasing two national songs, and dedicating 14 years to leading congregations in corporate praise & worship, Jason is moving in a bolder direction with his music. Indeed, encouragement abounds on Beautiful Design with tunes such as “Touch the Sky,” “You Found Me,” and “I Can’t Escape You,” all co-penned by Jason. The two tunes co-written with Nathan Walters are polar opposites. “Blame” is a haunting introspective song with lyrics such as “Lost my way and sense of direction / Faded away with the time I was wasting / I keep placing fault on someone else / I’m making excuses for myself / Drowning out the voice inside that says/You’ve got nobody else to blame.” The second Walters/Bare song is the bonus Christmas tune “For the First Time” which went straight to #1 on the national worship radio charts. Now leading worship at Kingdom Life Ministries in Virginia, Jason is a sought-after clinician for various worship conferences including the annual Throne Zone conferences. Jason has a unique perspective on the role of worship in the lives of Christians. Purposefully centered in the middle of Beautiful Design is the song that was lost and then found on that fateful day a year ago. “Story of Grace” continues to be Jason’s siren cry to people who feel they have gone too far or done too many things wrong to find God again.